Marvel’s Cinematic Universe: Phase One—Avengers Assembled has been teased for months and months, now, and luckily the release is right around the corner. The 10-disc set will hit stores tomorrow and will offer 3D Blu-ray and Blu-ray copies of some of Marvel’s most exciting films, as well as a special bonus disc chock full of extras. As if that weren’t enough, it will all come in quite pretty packaging, which can be viewed above. However, the set will cost fans quite a bit, so hopefully you’ve been saving your monies since the set was announced last June. At the time, we only knew what flicks would be available with the set—The Avengers (Blu-ray 3D and Blu-ray), Captain America: The First Avenger (Blu-ray 3D and Blu-ray), Thor (Blu-ray 3D and Blu-ray), Iron Man 2 (Blu-ray), The Incredible Hulk (Blu-ray), and Iron Man (Blu-ray). Now, we know all about the bonus features, but before we share that news with you, you should know that the list price for the set is $219. You can circumvent some of this cost by ordering the Marvel’s Cinematic Universe: Phase One set over at Amazon. 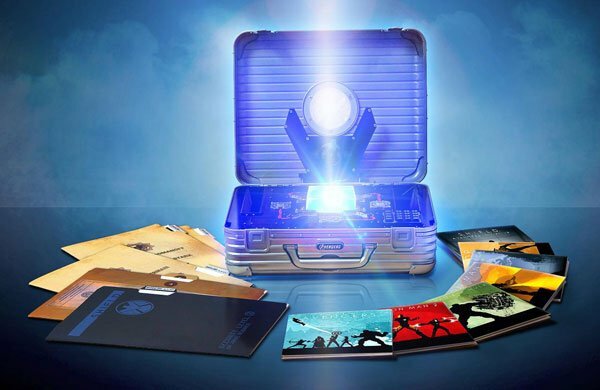 Most huge Marvel fans probably own most of the above flicks if not all of the above flicks, so the bonus content and the sweet briefcase packaging are the real reasons to indulge in the Phase One collection. I wish I could say there are a glut of bonus features with the disc, but there seems to only be a few, although fans can look forward to the Phase Two set within this set. Regardless, overall Phase One seems more memorabilia based—which isn’t necessarily a bad thing. You can check out the bonus fodder available with the set, below.